This noble house dates back to the Samnite, and has a large atrium and a double peristyle. The sumptuous state rooms is of type "oecus corinthius"; it shows ten columns along the walls, which accentuate the space effect of architectural paintings. The house was also equipped with private baths and a bakery with three grinding stones. Unlike other houses more or less extensively renovated during those years in marginal and suburban areas of the town, the House of the Labyrinth is still in the typology of the major domus with atrium. 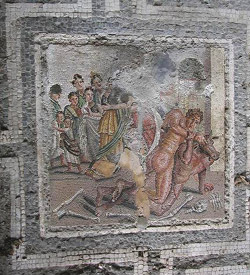 The most representative room of the house is without doubt the great Western cubicle where you can see the splendid mosaic with a central emblem depicts the fight between Theseus and the Minotaur, framed by the labyrinth which gave its name to the entire home.